For all the secrecy surrounding SEAL Team 6, it has been the public face of America’s Special Operations forces and so has garnered massive attention, especially, of course, after some of its members killed Osama bin Laden on a raid in Abbottabad, Pakistan, in 2011. It even won a starring role in the Oscar-winning Hollywood film Zero Dark Thirty, produced with CIA help, about the tracking down of bin Laden. As a unit, however, SEAL Team 6 is “roughly 300 assault troops, called operators, and 1,500 support personnel”; in other words, more or less a drop in the bucket when it comes to America’s Special Operations forces. And its story, however nonstop and dramatic, is similarly a drop in the bucket when it comes to the flood of special operations actions in these years. While SEAL Team 6 has received extensive coverage, what could be considered the military story of the twenty-first century, the massive, ongoing expansion of a secret force (functionally the president’s private army) cocooned inside the U.S. military – now at almost 70,000 personnel and growing – has gotten next to none. Keep in mind that such a force is already larger than the active-duty militaries of Australia, Chile, Cuba, Hungary, the Netherlands, Nigeria, and South Africa, among a bevy of other countries. If those 70,000 personnel engaging in operations across the planet – even their most mundane acts enveloped in a blanket of secrecy – have created, as the Times suggests, a new way of war in and out of Washington’s war zones, it has gone largely unreported in the American media. You can find them in dusty, sunbaked badlands, moist tropical forests, and the salty spray of third-world littorals. Standing in judgement, buffeted by the rotor wash of a helicopter or sweltering beneath the relentless desert sun, they instruct, yell, and cajole as skinnier men playact under their watchful eyes. In many places, more than their particular brand of camouflage, better boots, and designer gear sets them apart. Their days are scented by stale sweat and gunpowder; their nights are spent in rustic locales or third-world bars. These men – and they are mostly men – belong to an exclusive military fraternity that traces its heritage back to the birth of the nation. Typically, they’ve spent the better part of a decade as more conventional soldiers, sailors, marines, or airmen before making the cut. They’ve probably been deployed overseas four to 10 times. The officers are generally approaching their mid-thirties; the enlisted men, their late twenties. They’ve had more schooling than most in the military. They’re likely to be married with a couple of kids. And day after day, they carry out shadowy missions over much of the planet: sometimes covert raids, more often hush-hush training exercises from Chad to Uganda, Bahrain to Saudi Arabia, Albania to Romania, Bangladesh to Sri Lanka, Belize to Uruguay. They belong to the Special Operations forces (SOF), America’s most elite troops – Army Green Berets and Navy SEALs, among others – and odds are, if you throw a dart at a world map or stop a spinning globe with your index finger and don’t hit water, they’ve been there sometime in 2015. This year, U.S. Special Operations forces have already deployed to 135 nations, according to Ken McGraw, a spokesman for Special Operations Command (SOCOM). That’s roughly 70% of the countries on the planet. Every day, in fact, America’s most elite troops are carrying out missions in 80 to 90 nations, practicing night raids or sometimes conducting them for real, engaging in sniper training or sometimes actually gunning down enemies from afar. As part of a global engagement strategy of endless hush-hush operations conducted on every continent but Antarctica, they have now eclipsed the number and range of special ops missions undertaken at the height of the conflicts in Iraq and Afghanistan. In the waning days of the Bush administration, Special Operations forces (SOF) were reportedly deployed in only about 60 nations around the world. By 2010, according to the Washington Post, that number had swelled to 75. Three years later, it had jumped to 134 nations, “slipping” to 133 last year, before reaching a new record of 135 this summer. This 80% increase over the last five years is indicative of SOCOM’s exponential expansion which first shifted into high gear following the 9/11 attacks. Each day, according to SOCOM commander General Joseph Votel, approximately 11,000 special operators are deployed or stationed outside the United States with many more on standby, ready to respond in the event of an overseas crisis. “I think a lot of our resources are focused in Iraq and in the Middle East, in Syria for right now. That’s really where our head has been,” Votel told the Aspen Security Forum in July. Still, he insisted his troops were not “doing anything on the ground in Syria” – even if they had carried out a night raid there a couple of months before and it was later revealed that they are involved in a covert campaign of drone strikes in that country. In reality, the average percentage of Special Operations forces deployed to the Greater Middle East has decreased in recent years. Back in 2006, 85% of special operators were deployed in support of Central Command or CENTCOM, the geographic combatant command (GCC) that oversees operations in the region. By last year, that number had dropped to 69%, according to GAO figures. Over that same span, Northern Command – devoted to homeland defense – held steady at 1%, European Command (EUCOM) doubled its percentage, from 3% to 6%, Pacific Command (PACOM) increased from 7% to 10%, and Southern Command, which overseas Central and South America as well as the Caribbean, inched up from 3% to 4%. The largest increase, however, was in a region conspicuously absent from Votel’s rundown of special ops deployments. In 2006, just 1% of the special operators deployed abroad were sent to Africa Command’s area of operations. Last year, it was 10%. Globetrotting is SOCOM’s stock in trade and, not coincidentally, it’s divided into a collection of planet-girding “sub-unified commands”: the self-explanatory SOCAFRICA; SOCEUR, the European contingent; SOCCENT, the sub-unified command of CENTCOM; SOCKOR, which is devoted strictly to Korea; SOCPAC, which covers the rest of the Asia-Pacific region; SOCSOUTH, which conducts missions in Central America, South America, and the Caribbean; SOCNORTH, which is devoted to “homeland defense”; and the ever-itinerant Joint Special Operations Command or JSOC, a clandestine sub-command (formerly headed by Votel) made up of personnel from each service branch, including SEALs, Air Force special tactics airmen, and the Army’s Delta Force that specializes in tracking and killing suspected terrorists. The elite of the elite in the special ops community, JSOC takes on covert, clandestine, and low-visibility operations in the hottest of hot spots. Some covert ops that have come to light in recent years include a host of Delta Force missions: among them, an operation in May in which members of the elite force killed an Islamic State commander known as Abu Sayyaf during a night raid in Syria; the 2014 release of long-time Taliban prisoner Army Sergeant Bowe Bergdahl; the capture of Ahmed Abu Khattala, a suspect in 2012 terror attacks in Benghazi, Libya; and the 2013 abduction of Anas al-Libi, an al-Qaeda militant, off a street in that same country. Similarly, Navy SEALs have, among other operations, carried out successful hostage rescue missions in Afghanistan and Somalia in 2012; a disastrous one in Yemen in 2014; a 2013 kidnap raid in Somalia that went awry; and – that same year – a failed evacuation mission in South Sudan in which three SEALs were wounded when their aircraft was hit by small arms fire. 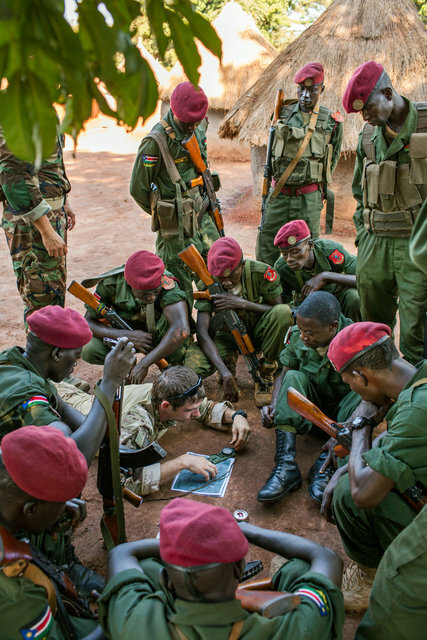 From 2012 to 2014, for instance, Special Operations forces carried out 500 Joint Combined Exchange Training (JCET) missions in as many as 67 countries each year. JCETs are officially devoted to training U.S. forces, but they nonetheless serve as a key facet of SOCOM’s global engagement strategy. The missions “foster key military partnerships with foreign militaries, enhance partner-nations’ capability to provide for their own defense, and build interoperability between U.S. SOF and partner-nation forces,” according to SOCOM’s McGraw. “SOCOM places a premium on international partnerships and building their capacity. Today, SOCOM has persistent partnerships with about 60 countries through our Special Operations Forces Liaison Elements and Joint Planning and Advisory Teams,” said SOCOM’s Votel at a conference earlier this year, drawing attention to two of the many types of shadowy Special Ops entities that operate overseas. These SOFLEs and JPATs belong to a mind-bending alphabet soup of special ops entities operating around the globe, a jumble of opaque acronyms and stilted abbreviations masking a secret world of clandestine efforts often conducted in the shadows in impoverished lands ruled by problematic regimes. The proliferation of this bewildering SOCOM shorthand – SOJTFs and CJSOTFs, SOCCEs and SOLEs – mirrors the relentless expansion of the command, with its signature brand of military speak or milspeak proving as indecipherable to most Americans as its missions are secret from them. Special Operations Command will not divulge the locations or even a simple count of its SOC FWDs for “security reasons.” When asked how releasing only the number could imperil security, SOCOM’s Ken McGraw was typically opaque. “The information is classified,” he responded. “I am not the classification authority for that information so I do not know the specifics of why the information is classified.” Open source data suggests, however, that they are clustered in favored black ops stomping grounds, including SOC FWD Pakistan, SOC FWD Yemen, and SOC FWD Lebanon, as well as SOC FWD East Africa, SOC FWD Central Africa, and SOC FWD West Africa. What’s clear is that SOCOM prefers to operate in the shadows while its personnel and missions expand globally to little notice or attention. “The key thing that SOCOM brings to the table is that we are – we think of ourselves – as a global force. We support the geographic combatant commanders, but we are not bound by the artificial boundaries that normally define the regional areas in which they operate. So what we try to do is we try to operate across those boundaries,” SOCOM’s Votel told the Aspen Security Forum. In one particular blurring of boundaries, Special Operations liaison officers (SOLOs) are embedded in at least 14 key U.S. embassies to assist in advising the special forces of various allied nations. Already operating in Australia, Brazil, Canada, Colombia, El Salvador, France, Israel, Italy, Jordan, Kenya, Poland, Peru, Turkey, and the United Kingdom, the SOLO program is poised, according to Votel, to expand to 40 countries by 2019. The command, and especially JSOC, has also forged close ties with the Central Intelligence Agency, the Federal Bureau of Investigation, and the National Security Agency, among other outfits, through the use of liaison officers and Special Operations Support Teams (SOSTs). SOCOM will not name the 135 countries in which America’s most elite forces were deployed this year, let alone disclose the nature of those operations. Most were, undoubtedly, training efforts. Documents obtained from the Pentagon via the Freedom of Information Act outlining Joint Combined Exchange Training in 2013 offer an indication of what Special Operations forces do on a daily basis and also what skills are deemed necessary for their real-world missions: combat marksmanship, patrolling, weapons training, small unit tactics, special operations in urban terrain, close quarters combat, advanced marksmanship, sniper employment, long-range shooting, deliberate attack, and heavy weapons employment, in addition to combat casualty care, human rights awareness, land navigation, and mission planning, among others. Nick Turse is the managing editor of TomDispatch.com and a fellow at the Nation Institute. A 2014 Izzy Award and American Book Award winner for his book Kill Anything That Moves, he has reported from the Middle East, Southeast Asia, and Africa and his pieces have appeared in the New York Times, the Intercept, the San Francisco Chronicle, the Nation, and regularly at TomDispatch. His latest book is Tomorrow’s Battlefield: U.S. Proxy Wars and Secret Ops in Africa.